Check the highlighted area into screenshot. After theme installation finished click on the Activate button to activate the theme on the website. Daron theme has been activated on the website. You can visit the site with the newly activating theme. After creating the menu it will show Menu Setting, this setting allows you to choose the menu display position on the homepage like Primary, Header, and Footer. The location feature depending on themes feature, some themes provide multiple menus location for it. The site navigation Menu has been added successfully. Currently, the homepage will show the post with right sidebar page. Now, open the theme customizer to set up the theme homepage click on the Customize button at the top bar. D) Click on the Publish button. 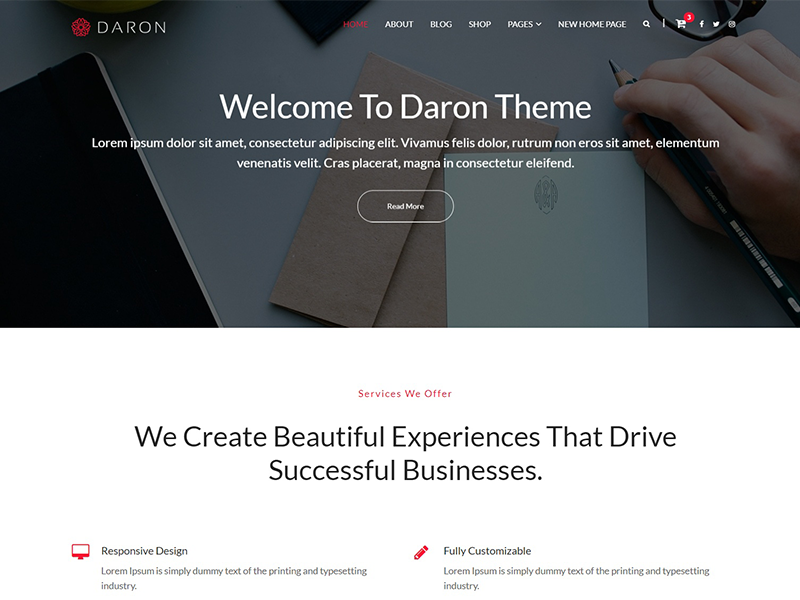 After activating Daron homepage, you will see first setting tab General Settings, which allows configuring theme core features like theme color, page template layout, single post page layout. In Daron homepage Setting select Social Icon Settings– Active to enable the social media icons on the homepage. now, you can hide end show social media icons and change link URL. In Daron homepage Setting select Footer Settings– Active to enable the widgets section on the homepage. Step back in customizer setting and select the Homepage Sections setting tab. Select the HomePage Slider Settings tab. In HomePage Slider Setting select Slider Section – Active to enable the slider on the homepage. Now, you can change the slide image, slide title, slide description, slide button text, link URL. In HomePage portfolio Setting select Portfolio Section – Active to enable the portfolio on the homepage. Now, you can change the image, portfolio title, portfolio description and settings like section title, section description, you can add up to Six Images in the portfolio. In premium version can add multiple Portfolio images without any limit. Step back in customizer settings and select the HomePage Service Settings setting tab. In HomePage Service Setting select Service Section – Active to enable the service on the homepage. Now, you can change the service icon, service title, service description and configure service section features settings like section title, section description, design layout, and column. You can add up to four services in that section. In premium version can add multiple services without any limit. In HomePage Blog Setting select Blog Section – Active to enable the blog on the homepage. Now, you can change the blog title, blog description and configure blog section features settings like column layout. In HomePage Testimonial Setting select Testimonial Section – Active to enable the testimonial on the homepage. Now, you can change the testimonial title, testimonial description and change testimonial image or Designation and description. in premium version can add multiple testimonials without any limit.